A few years ago I caught a show on Netflix called Wallander starring Kenneth Branagh as the Swedish detective. It fell in line with other mystery/thriller shows made overseas that I love (Broadchurch, Hinterland, Whitechapel, The Fall, etc.). When I learned that the show was based on the work of Swedish crime novelist Henning Mankell, I decided to give the first one a go. Mankell takes the reader on a series of swerving paths as any crime novelist does. His style reminds of Ken Follett’s crime novels (Eye of the Needle, The Key to Rebecca, A Dangerous Fortune), which was a delightful surprise. The process of discovery unfolds to readers as it does for Wallander, a man whose own demons involve an aging, senile father, a wife who wants a divorce, an estranged daughter, and a drinking problem. 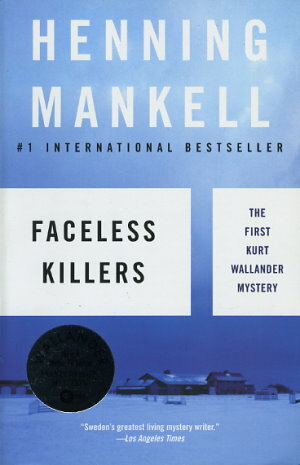 Readers meet other detectives and pertinent characters, but it is Wallander’s steps we trace. Faceless Killers is a detailed police thriller with plenty of hopeful leads and dead ends to make a reader anxious – but in the best way possible. Mankell creates the sort of frustration that compels you to keep reading. We must solve the mystery! We must know who did it! It’s this kind of pull that creates a bestselling series. When you wake up thinking about a fictional murder case and wondering if there are more clues to discover, you want to get up and read. A note about the publishing date – If you are at all paying attention to the current immigration/refugee issues in Sweden (or Europe as a whole), it might interest you that these matters were relevant 20 years ago. Forgive my historical ignorance, but that wasn’t something I understood in the late 1990s. The internal conflict among Swedes regarding immigration is not new, so to read about it in an older work of fiction was eye-opening. It put into perspective our own national debates about preserving culture, helping those in need, and immigration reform. I have two more Wallander books on hand, so hopefully those are as good, if not better, than the first. I’ll keep you posted.